The percent of first-time takers of HSPA performing at or above proficient in language arts literacy, increased from 51.7% to 59.5% from 2009-10 to 2010-11, with International High School demonstrating a 28% increase, Garrett Morgan demonstrating a 39% increase, and the three Eastside High Schools cumulatively increased by 6.5%. The percent of students in grades three through eight performing at or above proficient in mathematics on NJASK increased from 45.9% to 49.1% from 2009-10 to 2010-11. Within cohort analysis of grade 3-8 students on NJASK for the same period finds that four of five cohorts increased their performance in mathematics and three of five increased their performance in language arts literacy. Our graduation rate using the new cohort method (a comparison of students entering 9th grade as a cohort to those who graduated as a cohort four years later) for the 2011 graduating class increased to 58.7%, which is an increase from 50.4% in 2010 and 45% in 2009. This progress is an indication that our efforts are beginning to have an impact. I truly thank our staff, parents and community partners for your contribution to these outcomes. However, as you and I know, we must accelerate improvements in student outcomes. As a result, we have been afforded the opportunity to work with the Commissioner of Education's staff to develop additional school improvement strategies that are aligned with Bright Futures. This consultation has given rise to the development of the Paterson Innovation Zone. My staff and I designed the initiative, and in August 2011, the Commissioner gave his support to its implementation. The primary objective is to implement research-based school improvement practices in one-third of our schools and eventually add all underperforming schools during the next two to three years. By doing so, we will significantly accelerate increases in student achievement. Attached is a Question and Answer document that will hopefully serve to provide answers to the most frequently asked questions about the Innovation Zone. In coming weeks, I will be providing you additional information about this exciting initiative. 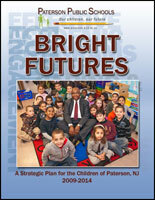 Meanwhile, if you have questions, please email me at superintendent@paterson.k12.nj.us.